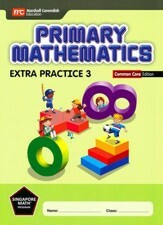 Singapore Math Primary Mathematics: Common Core Edition books have been updated where necessary to align with the CCSS. However, this does not mean that the content has been reduced in its level of difficulty. If CCSS called for content to be introduced at a later level, Singapore Math didn't move content from the earlier level, but rather simply revisits it more in-depth at the CCSS level. Singapore Math's Primary Math, Common Core Edition series features the Concrete> Pictorial> Abstract approach. Students begin by learning through concrete and pictorial means before moving into abstract thought and development, which encourages an active thinking process, communication of mathematical ideas, and problem solving. The spiral approach encourages mastery through the modeling method, which helps students to visualize problems as they work on specific skills. Concepts are introduced in the opening pages and taught to mastery through specific learning tasks; regular reviews help provide consolidation of concepts. Primary Mathematics, Common Core Edition Textbook 3A teaches students about numbers to 10,000, addition and subtraction, multiplication and division, multiplication tables of 6, 7, 8, and 9. 189 pages, softcover. This book is designed for the first semester of Grade 3. These non-consumable textbooks are meant to be completed with adult supervision and teaching. 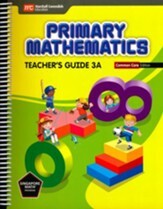 The sold-separately Primary Mathematics Standards Edition 3A Workbook is directly correlated with this textbook and should be used alongside this text, as it includes the learning tasks, practice and review problems necessary for mastery. Please note: The Primary Mathematics Common Core Edition resources cannot be used interchangeably with the Primary Mathematics U.S. Edition or Standard Edition resources. Answers are in the sold-separately Primary Mathematics Common Core Edition Teacher's Guide 3A. Singapore Math's Primary Mathematics workbooks are consumable and should be used in conjunction with the corresponding textbooks; these Common Core Edition workbooks are not compatible with other Singapore editions. Containing independent student exercises, workbooks provide the practice essential to skill mastery; these workbook sheets correspond to each chapter in the (sold-separately) textbook. A variety of exercises are presented in the c oncrete>pictorial>abstract approach, including numbers to 10,0000, addition and subtraction, multiplication tables of 6, 7, 8, and 9, and more. 197 pages, softcover. Grade 3. Workbook is 3A is designed for the first semester of the Grade 3 year, and follows the 2B curriculum. This workbook accompanies the sold-separately Primary Mathematics Common Core Edition Textbook 3A. Answer keys are not included, but are found in the Primary Mathematics Common Core Teacher's Guide 3A. Singapore Math's Primary Mathematics: Common Core Edition Teacher's Guides provide a clear framework for each lesson along with activities that expand and reinforce concepts. Teacher's guides will work for both teachers who wish to adapt lessons to their own classroom situation, and teachers who desire easy-to-follow, effective teaching strategies. Units open with objectives, common core state standards, practices, and prerequisites; notes to the teacher and detailed objectives for each lesson are included to help instructors fully understand the purpose and concept behind each set of problems. Exercises are clearly laid out with detailed instructions on teaching with any textbook page numbers referenced. This teacher's guide contains answers for the textbooks and workbooks; reduced-size student pages with the correct answers overlaid are provided. Books are designed to be taught by classroom teachers using the Primary Math Common Core Edition and are not compatible with other Singapore Primary Math editions. 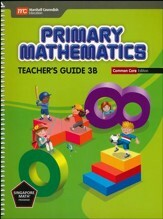 This teacher's edition accompanies the Singapore Primary Mathematics 3A curriculum, for the first semester of Grade 3. 427 pages, spiralbound softcover. 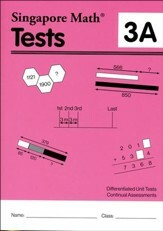 This book of tests accompanies Singapore Math's sold-separately Primary Mathematics Common Core Edition 3A Textbook These tests follow the concepts taught in the textbook, with each chapter including a Test A and Test B; two Continual Assessment Tests (with Test A and Test B for each) cover topics from earlier units. Test A focuses on key concepts and fundamental problem-solving skills. Test B focuses on the application of analytical skills, thinking skills, and heuristics. In Continual Assessment Tests A and B, questions from earlier units are incorporated into each test, focusing on review through integrated concepts and strands. 160 pages, softcover. Grade 3. A line-listed answer key is provided at the end of the book. Primary Mathematics, Common Core Edition Textbook 3B teaches students about mass and weight, capacity, fractions, time, data analysis, area and perimeter, and more. 191 pages, softcover. Grade 3. These non-consumable textbooks are meant to be completed with adult supervision and teaching. 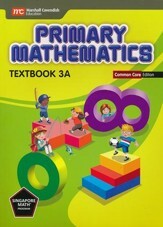 The sold-separately Primary Mathematics Standards Edition 3B Workbook is directly correlated with this textbook and should be used alongside this text, as it includes the learning tasks, practice and review problems necessary for mastery. Singapore Math's Primary Mathematics workbooks are consumable and should be used in conjunction with the corresponding textbooks; these Common Core Edition workbooks are not compatible with other Singapore editions. Containing independent student exercises, workbooks provide the practice essential to skill mastery; these workbook sheets correspond to each chapter in the (sold-separately) textbook. A variety of exercises are presented in the concrete>pictorial>abstract approach, including numbers to length, weight, capacity, money, fractions, time, geometry, area, perimeter, value. 184 pages, softcover. Grades 3-4. Workbook is 3B is designed for the 2nd semester of the Grade 3 year, and follows the 3A curriculum. 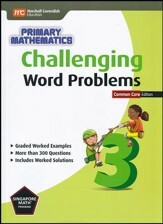 This workbook accompanies the sold-separately Primary Mathematics Common Core Edition Textbook 3B. Answer keys are not included, but are found in the Primary Mathematics Common Core Teacher's Guide 3B. Singapore Math's Primary Mathematics: Common Core Edition Teacher's Guides provide a clear framework for each lesson along with activities that expand and reinforce concepts. Teacher's guides will work for both teachers who wish to adapt lessons to their own classroom situation, and teachers who desire easy-to-follow, effective teaching strategies. Units open with objectives, common core state standards, practices, and prerequisites; notes to the teacher and detailed objectives for each lesson are included to help instructors fully understand the purpose and concept behind each set of problems. Exercises are clearly laid out with detailed instructions on teaching with any textbook page numbers referenced. This teacher's guide contains answers for the textbooks and workbooks; reduced-size student pages with the correct answers overlaid are provided. Books are designed to be taught by classroom teachers using the Primary Math Common Core Edition and are not compatible with other Singapore Primary Math editions. This teacher's edition accompanies the Singapore Primary Mathematics 3B curriculum, for the second semester of Grade 3. 337 pages, spiralbound softcover. 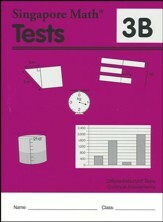 This book of tests accompanies Singapore Math's sold-separately Primary Mathematics Common Core Edition 3B Textbook . These tests follow the concepts taught in the textbook, with each chapter including a Test A and Test B; one Continual Assessment Test (with Test A and Test B for each) and a year-end test (which covers all concepts taught up to that point) are also included. In Continual Assessment Tests, questions from earlier units are incorporated into each test, focusing on review through integrated concepts and strands. Softcover. Grade 3. A line-listed answer key is provided at the end of the book. Extra Practice for Primary Mathematics Common Core Edition follows the topical arrangement in the Primary Mathematics Common Core series. The exercises generally provide problems of a similar style and level of difficulty as the course material, but are short and specific. Instructors may assign only those topics in which students need more practice. This series may be used as test review, to review concepts, as a summer workbook, or as homework. Answers are provided at the back of the books. Extra Practice Book 3 covers addition and subtraction, multiplying and dividing by 6, 7, 8, and 9, length (metric and US), mass and weight (metric and US), fractions, money, time, data analysis, area and perimeter, and more. 256 pages, softcover. Non-reproducible, consumable workbook. This extra practice book accompanies the Singapore Primary Mathematics Textbook, Common Core Edition 3A and Singapore Math: Primary Math Textbook 3B Common Core Edition. This Common Core Edition has been updated to align with the Common Core State Standards for Mathmatics. Challenge your advanced math students or provide new goals for students of every ability level with this book of challenging math problems. Designed to complement both the Singapore Math Primary Mathematics Common Core series, these books will help improve students' problem-solving skills and mathematical reasoning abilities. Students will need to use a variety of problem-solving strategies, and alternative methods can be used to arrive at the answer. Even advanced students will most likely require some assistance. Review Questions allow students to review and test their understanding of the concepts from the Primary Mathematics textbooks and earlier topics. Answer key included. 222 pages, softcover. Grades 3.